Whoever wrote the guidebook description of the planet of Nila Marbela must have a very different meaning for the word "paradise." When ex-military sniper and current personal security specialist Jerzi Adams visits his daughter Pico's quiet college, he doesn’t expect emergency evacuations and rogue robots. Nor does he expect to renew a friendship with former squadmate, Andra DeLuna. Explosions, sabotage, and assaults used to be her routine, but she gave it up for a professorship at a prestigious university. When the hunt for a cunning serial killer leads Jerzi's old friends Luka and Mairwen (Overload Flux) to town, trouble in paradise is the least of anyone's worries when the body count starts to rise. Either the world of academia has gone from merely cutthroat to downright deadly, or more sinister forces in conflict, with the campus as a battleground. It's going to take an improvised miracle or two for everyone to make it out alive. Pico's Crush is space opera, adventure, and romance that give new meaning to the old curse, "may you live in interesting times." 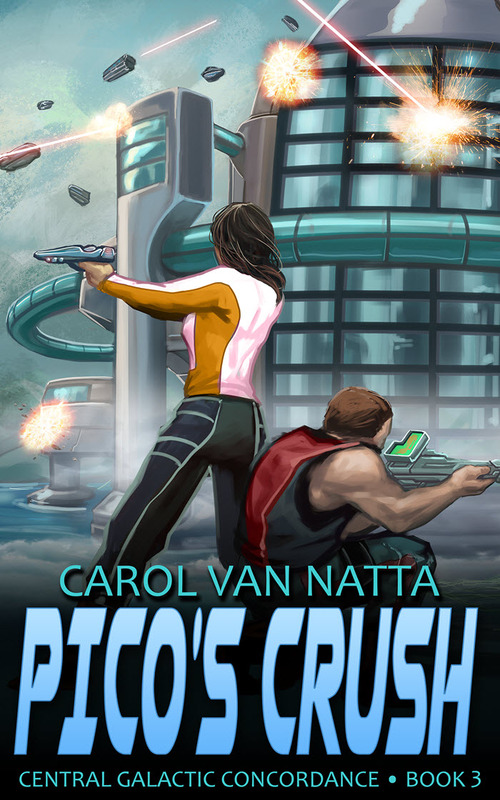 Pico's Crush is the third full novel in Carol Van Natta's Central Galactic Concordance series. I feel it can be read as a stand-alone even though it centers on some characters we've met in books one and two. As with book two, Van Natta builds on the previous book to satisfy the world building needs of anyone following the series without overburdening us with back story. She balances her seamless continuity of the series with new places and scenes. Pico's Crush teams up two romance arc's with Jerzi Adams (from Overload Flux) and his old military friend Andra DeLuna along with Jerzi's daughter Pico and summer-camp crush Sojaire. Sojaire visits along with Luka and Mairwen also from Overload Flux. Together they face all sorts of suspicious activity and villains on Pico's tropical college campus. Van Natta keeps up her infectious humour which she puts to good use showing us the past camaraderie between Jerzi and Andra. It not only brings them together, but welcomes us in to the easy and comfortable friendship they're both resistant to give up. Pico and Sojaire have a history together as well but very different from Andra and Jerzi. In contrast to Jerzi and Andra where their past is an anchor, Pico and Sojaire's pasts act as an obstacle keeping them apart. I also love how the growth of Pico, Sojaire, Andra and Jerzi is grounded with the stable and familiar relationship between Luka and Mairwen. Van Natta keeps all the plates spinning, so to speak. I've found her novels contain a well rounded combination of contrasts and balance. For me, the big surprise was the next-level crop of bad guys. I thought the Citizen Protection Service (aka CPS or capital A Antagonists) in book two, Minder Rising, sufficiently demonstrated the nasty subversiveness of the CPS but Pico's Crush pushes even harder. This batch of CPS no-gooders could be considered terrifying. In spite of their gory, co-dependent and evil natures they're enlightened with enough humanity to make them endearing in an uncomfortably dark yet relatable way. 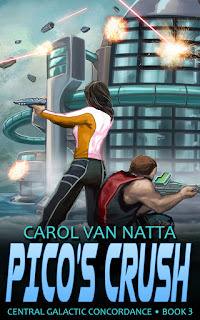 If you love character driven sci-fi with gadgets, superpowers and tons of action, Pico's Crush will hit all the targets.